Such a diagnostic test could permit the widespread screening of all individuals in high-risk regions—a practice global health experts agree is likely required to eradicate malaria. It could also provide a way to diagnose submicroscopic malaria infections during pregnancy, which bring substantial health risks for the pregnant woman, her fetus, and the newborn child. A team led by Dr. Serge Barcy, a principal investigator in the Center for Global and Infectious Disease Research at Seattle Children’s, first uncovered the novel proteins associated with malaria in their study of a promising source of diagnostic biomarkers known as exosomes. Healthy and infected cells continuously secrete exosomes carrying genetic information or protein content as a way to communicate with other cells. Previous studies have also suggested that exosomes from infected cells may play a significant role in disease progression. Since many of the rapid tests in use today need high levels of the disease-causing parasite, virus or bacteria circulating in the blood to detect disease, scientists believe that identifying changes in the expression of the always present exosomes circulating in human plasma could offer a better way to detect submicroscopic infections. In his study, Barcy initially set out to determine if changes in the expression of a type of small RNA frequently found in exosomes and associated with disease known as microRNA (miRNA) could provide a reliable way to detect Kaposi’s sarcoma-associated herpesvirus infection (KSHV or HHV-8). In individuals infected with HIV, KSHV commonly progresses into a cancer known as Kaposi’s sarcoma, which remains prevalent in Sub-Saharan African populations. The study took an unexpected turn when researchers analyzed the genetic content of exosomes present in blood samples from a Uganda study population. Since miRNAs are typically found in plasma exosomes, researchers expected to find a high percentage of the small RNA in the exosomes purified from the plasma of study participants. 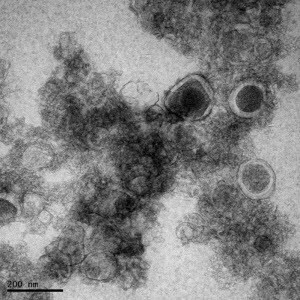 Instead, researchers were perplexed to find another type of small RNA in abundance, leading them to look at the protein content of the exosomes. It was here they discovered several peptides associated with a separate infection—Plasmodium falciparum, the primary parasite responsible for malaria in Africa. According to a paper published in the scientific journal, PLOS One, none of the protein biomarkers revealed in this study have previously been detected in blood samples from patients diagnosed with malaria. To test the diagnostic potential of the new biomarkers, Seattle Children’s is collaborating with a research group from Osaka City University in Japan led by the world-renowned malaria expert, Dr. Akira Kaneko. Kaneko’s lab has provided malaria samples that researchers in Seattle can analyze for the presence of the newly identified biomarkers. If their research is successful, it could lead to the development of a rapid diagnostic test to identify malaria infections in individuals without any symptoms. Currently, no rapid screening method exists to diagnose malaria infection in individuals with low levels of parasites in their blood. The results from Barcy’s study also indicate that ongoing efforts to eliminate endemic disease may benefit from addressing the dynamic interactions between infections, especially in geographic regions where multiple infections are widespread.